A lot of anglers believe that trout either feed along bottom or at the surface. This thinking, while mostly correct, throws a lot of anglers for a loop when they venture out onto the ice. Trout behave differently under ice. They can no longer feed on top, and being the ornery fish they often are, they may also shun the bottom. When it fits their mood, these trout may suspend at whatever depth they like, cruising and feeding in small schools, and a tuned-in angler may catch a lot of trout before a school swims away. One of my ice-angling buddies, Bob Jones of eastern Pennsylvania, said he really didn’t understand their suspending ways until he came upon a mid-water bite by accident. He has enjoyed years of catching suspended trout since, often while watching other ice anglers fail to get a bite with their baits all on the bottom. To satisfy his curiosity as much as anything, he raised the jig up to the top and then dropped it down about 2 feet. He knew he was fishing over 14 feet of water, so this short fall left the bait nowhere near the bottom. Yet within less than a minute, the line started moving to the side, and he set the hook on a good rainbow. Besides being quick to pick up on a new angling technique, Jones is also quick on the draw. He had his bait back in the water within seconds, and he caught two more trout before the bite stopped five minutes later. Jones said he often confirms the presence of suspended trout by watching a flasher unit. The circular dial will be blank except for the bar that indicates the bottom. Then the dial lights up with blinking or wavering lines that indicate moving, suspended fish. When fishing a spoon, he may watch the fish coming to the lure (even a small spoon will show up on a flasher) and then watch it disappear. When a spoon simultaneously disappears from the flasher screen and you feel a nip on the line, it’s a thing of angling beauty. The trick to catching more of these suspended trout often comes down to how fast it takes for you to react as the fish suddenly appear on the screen. Sometimes it’s about impossible to guess at what level in the water column these trout may be moving, but if you are working a jig or spoon, you can quickly adjust the depth until you intercept them. In Pennsylvania, we’re allowed to deploy five “ice devices” within our nearby grasp, and my usual setup is three or four jigging sticks stuck in weighted buckets and one or two tip-ups, or traps, as they’re called in New England. I start out drilling several holes, often within a 10-square-yard area. Then I put one bait close to bottom and stagger the rest up at different depths. I usually don’t present a bait too close to the ice sheet—until something tells me that I really should. If I’m working 10 feet of water, the baits start out staggered at about 1-foot intervals up to about 4 feet of the ice. If I’m fishing deeper water, the baits are more widely dispersed. I try to center things around the mid-level rung of the water column, typically starting about three or four feet above bottom and working up a couple of feet at a time until I have all five lines out. With a friend or two (like Jones) we can stagger our bait levels even more. Trout tend to go higher or lower in the water column depending on the light penetration. I believe sunlight gets the whole food chain moving and rising in the water column, and trout are pulled up by the activity. Consequently, fish deeper under the ice on dark days when the food chain is inactive, but go shallower as the sun shines and the bright bite picks up. And there are other factors to consider. Thin ice also has a way of motivating suspended trout. Frankly, I’m sick of people talking about “early ice” and “late ice” when the discussion should be about thick ice or thin. If a lake doesn’t form its first safe ice until the middle of January, it’s still good ice because the light penetration will still be good. If a hard freeze sends the ice 18 inches thick, regardless of how long ago the ice formed, very little light is penetrating, and the bite probably won’t be as good. The more devoid a lake is of bottom structure, the more important targeting the suspended trout can be. I’ve caught good numbers in lakes with flat sand and silt bottoms. There’s no attracting structure close to bottom. Consequently, the trout move through the water column searching for food. In lakes that have a rocky or rumbled floor, I may keep more baits deeper and tighter to the bottom. I like small jigs and chain-hooked spoons equally well, and I adorn both with wax worms, spikes or mousies. 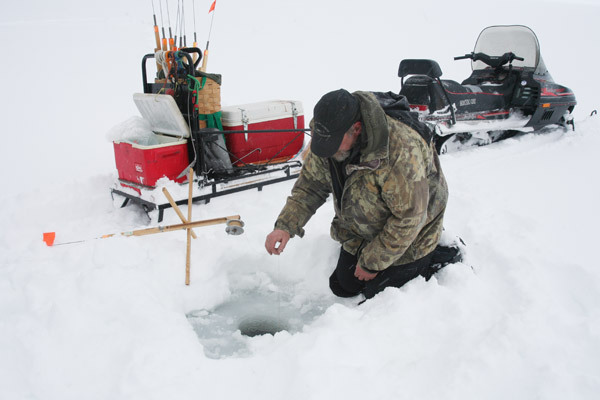 I typically spool up with 2- or 3-pound-test of one of the thin new ice lines. The lighter and thinner, the better. Under tip-ups, I float small fathead minnows, and I like two-hook rigs rather than one, kept about 18 inches apart to better stagger the presentation. The bottom line to fishing for suspended trout is that there often is no bottom line. Scattering baits from top to bottom may be the best way to quickly locate and catch feeding trout.